The oil-rich Gbaramatu Kingdom of Delta State and its partners, Missouri American Energy, are ready to build the first modular refinery in the country to process 20,000 barrels of crude per day. The Traditional Prime Minister of Gbaramatu Kingdom, Wellington Okirika, and the Chief Executive Officer of Missouri Energy, Henry Iwenofu, said this after a meeting with Vice President Yemi Osinbajo on Thursday. 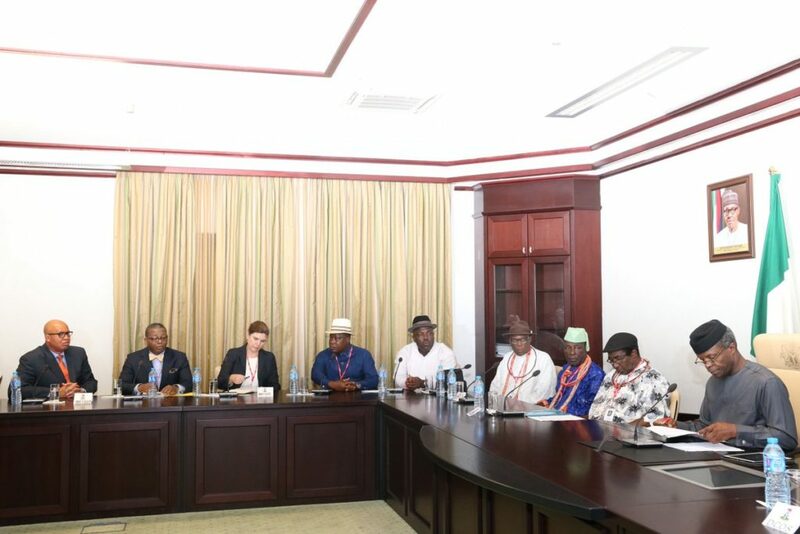 Speaking earlier during the inter-ministerial meeting on the Niger Delta in the Presidential Villa, Abuja, Osinbajo said the Federal Government will engage the Niger Delta communities on construction of modular refineries on the basis of trust. “We are saying there is a way out of violent agitation, but it is by creating opportunities and the environment where the people in the communities can benefit. We will engage them on the basis of trust; we must prove to them that we are trustworthy,” Osinbajo said. According to Okirika, the project is in response to the political will established by the Muhammadu Buhari administration on modular refineries and to develop the oil producing communities. “So we are very excited that there is now the opportunity to develop our degraded environment and turning the fortunes round. The issue of illegal refinery will be over; the issue of illegal bunkering will be over. We will be producing refined products; it will stop the importation of refined products into this country. How can we be selling our crude oil and just spending the money? We don’t have added value to the crude oil value; but now we are going to have a chain of values. The Bolowei of Gbaramatu and Consultant on Modular Refineries said the community initiated the Gbaramatu Oil and Gas Producing Trust Fund with the objective of empowering the community, developing and industrializing the degraded environment. According to Okirika, one of the options to develop the environment is the modular refinery. “We have been on this matter for some years now. It has been on the drawing board. We got excited when the presidency during the tour of the Niger Delta made pronouncement on modular refineries. So, we got back to the drawing board and we came here to tell Mr. President that this option of modular refineries has been accepted and adopted by our people since about eight years ago,’’ he said. The community leader said the kingdom made publications which it circulated including in the U.S.
“We went everywhere but there was no political will at the center. Now that there is a political will to do the right thing we came here to provide a document to show that we are the model that can produce the first modular refinery in Nigeria. It is 20,000 barrels per day modular refinery. It will create jobs and create wealth. Those of us in the oil-producing communities, our environment has been degraded by the oil industry and if you go there you will find that there is nothing like industry. And the only industry that can be established will be based on the raw materials that are available in massive quantities,’’ he added. “We are interested in this economic development in the Delta and the policy from the federal government. And we appreciate the opportunity to invest in the area. But there are certain things that we need to see. We saw it today which is the dedication from the Vice President that the government is ready and willing to assist in which way that is business-like, that is transparent as we can see here which will make the communities that produce the oil benefit from the resources from their community,’’ Iwenofu said. Iwenofu said that the organization was ready to train the people of the community to work and operate the refinery. He said that most of the people would benefit from the refinery being sited in their community and in other aspects of the economy. “So there is multiplier effect in having the refinery in the communities, not only in Gbaramatu but in the Delta area,’’ he explained. The investors requested among other things the relaxation of regulations and controls which could delay the importation of plants and equipment. They also asked for guarantee of 80 per cent crude oil stock, five year tax exemption and CBN guarantee to the foreign investors to repatriate their funds as appropriate.